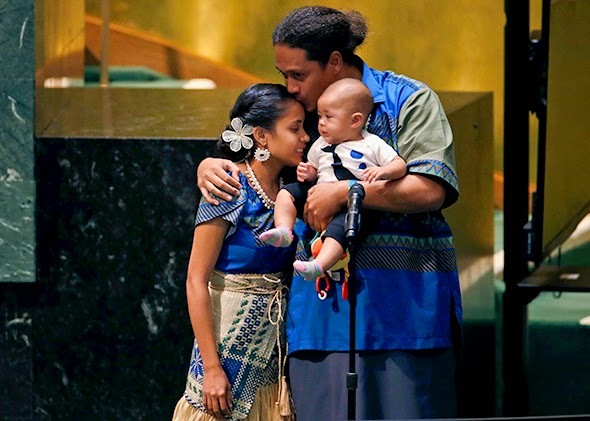 In September this year, Kathy Jitnil-Kijner, a 26-year-old poet from the Marshall Islands recited her poem for her infant daughter at the UN Climate Summit. The poem highlighted the dreadful results of climate change and received a standing ovation, and was also reported to have “brought world leaders to tears”. And bald as the Buddha. And our morning walks along the lagoon. With only a passport to call home. No one will come and devour you. Are going to push this Mother Ocean over the edge. No one is drowning, baby. No one’s losing their homeland. No one’s going to become a climate change refugee. Or should I say, no one else. Bubu,Jimma, your country, and president, too. Spread the word, speak out, make a change. And plant a tree, today.